Dr. Boonn is currently a Chief Radiology Resident at the Hospital of the University of Pennsylvania, Philadelphia, PA and expects to complete his diagnostic radiology residency in 2007. He completed medical school training at the Mount Sinai School of Medicine in New York City in 2002 and a transitional medicine internship at the Albert Einstein Medical Center in Philadelphia in 2003. During research track residency, he participated in the Imaging Informatics Fellowship program at the University of Maryland Medical Center and Baltimore VA Medical Center, Baltimore, MD. He plans to continue his training at the Hospital of the University of Pennsylvania as a Cardiovascular Imaging Fellow. In addition to his radiology training, Dr. Boonn is also Founder and President of MedicalPocketPC.com Inc. as well as co-Founder of iVirtuoso Inc. Dr. Litt is an Assistant Professor of Radiology and Section Chief of Cardiovascular Imaging, Department of Radiology, the Hospital of the University of Pennsylvania, Philadelphia, PA. Dr. Charagundla is an Assistant Professor of Radiology, Department of Radiology, the Hospital of the University of Pennsylvania, Philadelphia, PA.
Coronary artery computed tomographic angiography (CTA) demands specialized contrast injection techniques to optimize enhancement of the coronary vasculature while minimizing artifact. An overview of the theories behind contrast injection protocols in CTA, the metrics that are currently employed to assess the quality of contrast injection, and the variables affecting contrast enhancement will be presented as an introduction to bolus geometry. The current application of these theories will be discussed in modifications of injection protocols, opinions on contrast media selection and timing methods, specialized indications for cardiac CT, and future developments. 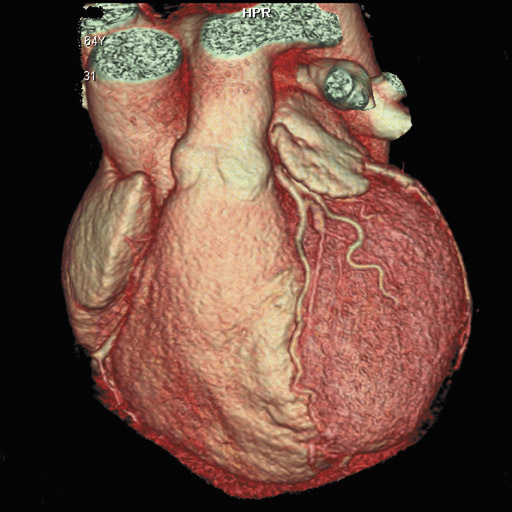 In recent years, multidetector computed tomography (CT) technology has advanced rapidly as commercial scanners have progressed from 4 to 16- to 64-detector rows, making coronary CT angiography (CTA) a clinical reality. In addition to providing better spatial resolution, multi-detector CT scanners are significantly faster, resulting in shorter breath-hold requirements, reduced motion artifacts, and decreased contrast volume requirements when compared with single-detector-row helical scanners or conventional nonhelical scanners. 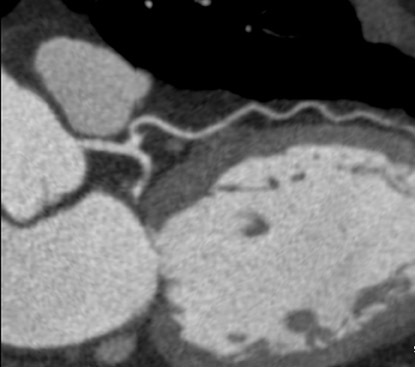 The advent of 64-slice CT promises not only to enhance the utility of coronary CTA in a broad range of patients, but also to eliminate the need for conventional, invasive diagnostic coronary angiography in an appropriately selected population of patients (Figure 1). The effectiveness of multidetector CTA in assessing coronary artery pathology is supported by a growing number of research reports that detail various techniques in the clinical setting. 1-7 Among the consensus findings of these and other studies is that optimized contrast injection protocols are critical in providing uniform enhancement of the coronary arteries for diagnostic accuracy. 8-11 This article provides an overview of the theories behind contrast injection protocols in CTA, the metrics currently employed to assess the quality of contrast injection, and the recognized variables affecting contrast enhancement. Modifications of injection protocols, opinions on contrast media selection and timing methods, specialized indications for cardiac CT, and future developments in customized injection protocols will be discussed. An optimum contrast injection protocol for coronary CTA must provide uniform enhancement of structures being evaluated with minimum contrast-bolus related streak artifacts as well as minimal contrast load to reduce the risk of contrast-induced nephropathy. Achieving each of these goals simultaneously calls for a delicate balance of technique and has been the subject of substantial theoretical and practical research. Contrast-bolus geometry is usually graphed as a time-density curve (TDC), in which the enhancement of a selected vessel is measured over time. An ideal TDC would have an immediate increase in enhancement at the start of CT acquisition, maintain a uniformly flat plateau throughout the scan, and return to zero at the end of the scan (Figure 2). 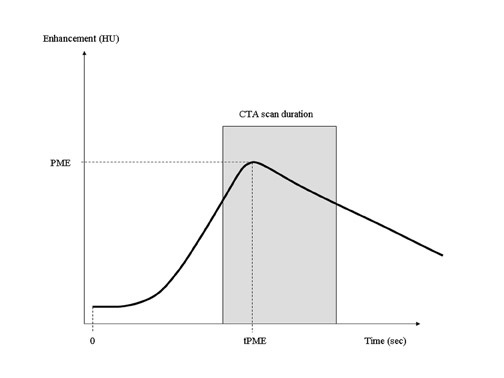 The actual bolus geometry usually indicates a steady rise in enhancement to a peak enhancement value, followed by a steady decline (Figure 3). A CT scan acquisition typically occurs over the upslope and downslope of the curve, resulting in nonuniform enhancement. Several techniques for the optimization of contrast injection parameters, including mathematical models that predict bolus geometry, are aimed at "flattening" the plateau of the curve to more closely match the ideal TDC. Becker et al 12 have suggested that optimal enhancement of coronary arteries in CTA is between 250 and 300 HU and have also suggested that levels >350 HU should be avoided because of difficulties in differentiating contrast from coronary calcifications. 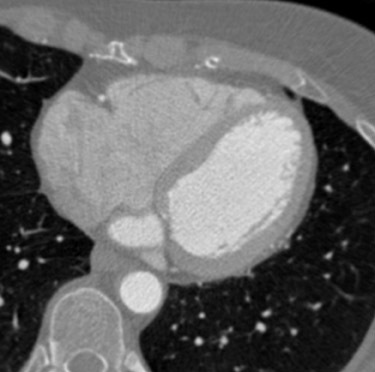 Although this group's original work was performed on a 4-slice CT unit, these suggestions remain relevant and are used in a number of currently recommended techniques and mathematical approaches to CTA contrast enhancement. Several complex mathematical models have been developed to predict bolus geometry. A detailed description of these models is beyond the scope of this article; however, familiarity with the general approaches and utility of the most widely used models is important to understand both current and novel approaches to CTA contrast investigations. Cademartiri et al 13 have provided an excellent review of parameters affecting bolus geometry in CTA, including experimental and human studies and a detailed description of methods of bolus timing. 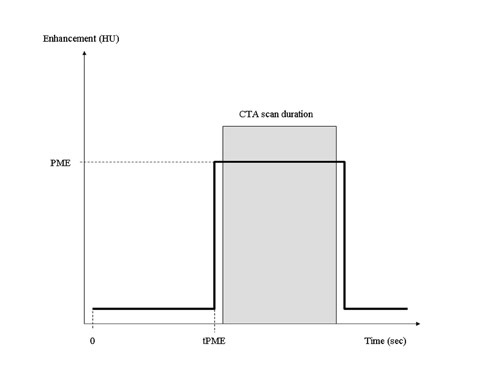 The model proposed by Fleischmann et al 14,15 considers the patient to be a "black box," so that empirical data from inputs (test bolus parameters) and outputs (TDCs) can be used to calculate a transfer function to optimize parameters for contrast injection. As part of this customized approach to imaging, the group has proposed the use of a biphasic injection protocol. 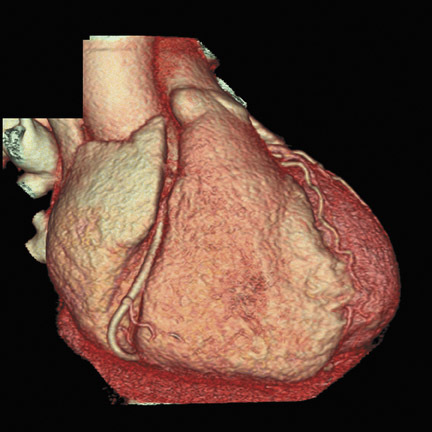 Several metrics have been used to quantify image quality in coronary CTA. 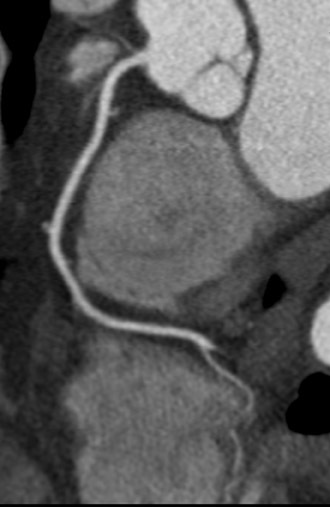 The most common is CNR, calculated by subtracting the CT attenuation of surrounding connective tissue from the CT attenuation of the lumen of the coronary artery and dividing that by image noise in the lumen of the aortic root at the level of the left coronary artery. Image noise is defined as the standard deviation of CT attenuation within a circular region of interest (ROI). 9 The other common metric is the length of each coronary artery and various branches where the enhanced lumen is clearly visible without motion artifact. Several groups, most recently Ferencik et al, 9 have discussed approaches to quantifying image quality in 64-slice CTA of coronary arteries. A wide variety of intravenous (IV) contrast media-with a range of iodine concentrations and osmolarity-exist for use in coronary CTA. Increasing concentrations of contrast media result in increasing vascular enhancement--a simple relationship complicated by a number of confounding factors that must be considered in the selection of optimal contrast media for coronary CTA. 20,21 The highest level of enhancement is seen with 400 mgI/mL (iomeprol); 22 however, iomeprol is not approved by the U.S. Food and Drug Administration (FDA). Commonly used high-concentration contrasts in the United States include iohexol (350 mgI/mL), iopromide (370 mgI/mL), and iopamidol (370 mgI/mL). A saline bolus-chase is the IV injection of normal saline immediately after the injection of the contrast material, usually through a double-barrel injector or with 2 injectors joined by a T-connection. 24,25 The saline bolus-chase provides several benefits in coronary CTA. Its use results in a tighter contrast column, increased enhancement within the coronary arteries, reduced contrast volume requirement, and decreased streak artifact from the superior vena cava and right atrium (Figure 4). 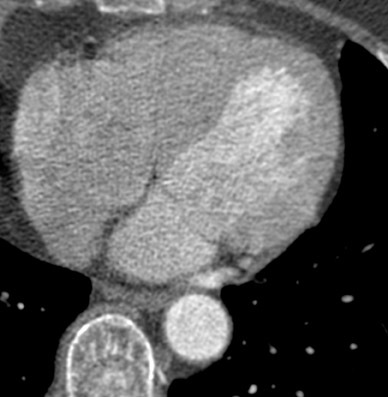 Poor timing of the saline chase may result in near complete filling of the right side of the heart with saline, making morphologic characterization of the right ventricle and interventricular septum difficult (Figure 5), which may be important when evaluating patients with congenital heart disease. Several institutions have addressed this problem by implementing triphasic injections: 100% contrast injection, followed first by a 50%/50% or 60%/40% mix of contrast and saline, and finally by a 100% saline bolus chase to increase opacification in the right side of the heart without streak artifact (Figure 6). Contrast injection rates for coronary CTA typically ranges from 4 to 6 mL/sec. For consistency, most institutions have standardized administration protocols to injection in the antecubital vein with an 18- to 20-gauge peripheral IV catheter. The TDC of a standard IV injection of contrast indicates a slowly increasing enhancement profile that peaks just after completion of the injection (Figure 3). As noted previously, several techniques have been proposed to "flatten" this curve and provide a more uniform enhancement profile throughout the scan. "Biphasic" injection may imply different rates of contrast injection (rather than different concentrations as described above). For example, a contrast injection with an initial high rate followed by a lower rate 14,15 has been reported to show a more uniform enhancement pattern than a monophasic injection rate (Figure 7). Bae et al 16,17 has shown in both computer and porcine models that a variable-rate multiphasic injection using an exponential decay profile provides an even flatter TDC and a more uniform enhancement. As scanners have become faster and scan durations have decreased, the time window for optimal contrast enhancement within the coronary arteries has narrowed significantly, so that fixed delays for initiating the scan after contrast injection are not recommended. 26 Two commonly used methods for timing the start of the scan are based on a test bolus or automated bolus tracking. For test-bolus timing, a small amount of contrast (10 to 20 mL) is injected while acquiring a series of dynamic, low-dose monitoring scans at the level of the vessel of interest. An ROI is drawn within this vessel, and a time-enhancement curve is generated with a time to peak enhancement. These data are used to calculate the injection delay for the diagnostic scan. Several published injection protocols for 64-slice coronary CTA using the test bolus technique are included in Table 1. The automated bolus-tracking technique involves real-time monitoring of the vessel of interest with a series of low-dose monitoring scans during the diagnostic injection. 27 When the enhancement within the ROI reaches a threshold level (usually between 100 and 140 HU above baseline), the table is moved into position for the beginning of the diagnostic scan. Table 2 includes several published injection protocols for 64-slice coronary CTA using bolus tracking. As CT scanners continue to advance in both spatial and temporal resolution using ever-increasing numbers of detector rows, increased gantry speed, and other novel technologic developments, acquisition times will continue to decrease. 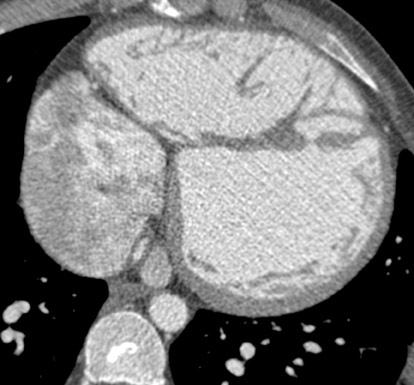 New dual-source 64-slice CT, for example, may permit imaging of the coronary arteries without motion artifacts in a substantially larger percentage of patients than possible with previous scanners. 33,34 The advent of 256-slice scanners allow imaging of the heart in a single gantry rotation, which offers the possibility of true dynamic imaging of the heart. Contrast injection parameters and protocols will need to be modified to accommodate each of these advances. The contrast volume needed to achieve optimal results is likely to decrease with more rapid acquisition techniques. In addition to the assessment of the coronary arteries, cardiac CT has been considered for the evaluation of cardiac function and perfusion, a domain currently dominated by cardiac MR and nuclear cardiology. For example, Nikolaou et al 35 have reported that chronic myocardial infarction can be detected in most individuals using multidetector CTA but that the technique cannot yet reliably detect ischemic perfusion defects under resting conditions. Koyama et al 36 recently described a 2-phase technique that, when performed after reperfusion therapy, could serve as a predictor of left ventricular functional recovery. Studies have shown that cardiac output can be estimated by the TDC from a test-bolus injection. 29 Tailoring the injection profile to the estimated cardiac output based on the test-bolus injection may provide more consistent enhancement of the coronary arteries. Contrast injection volume can also be customized to the patient's weight. Several studies have found an inverse relationship between patient weight and peak enhancement. 18 Modifying the volume of contrast based on the patient's weight can avoid excess contrast administration to thinner patients while ensuring optimal enhancement in heavier patients. Technology currently exists to take these multiple factors into account and to customize an injection protocol for each patient. However, the workflow to achieve this is cumbersome, and more automated and efficient mechanisms need to be developed to integrate individualized injection protocols into routine clinical practice. 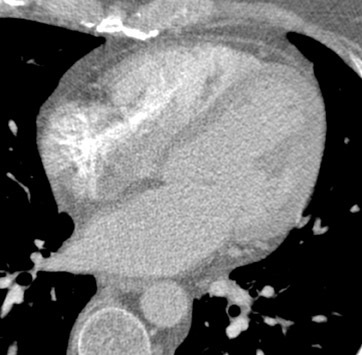 Rapid advances in multidetector CT technology have been paralleled by corresponding advances in contrast injection techniques. In addition to delivering contrast at a higher rate and for a shorter duration to keep up with today's faster scanners, techniques have been developed to improve the consistency of enhancement while minimizing artifact and reducing the overall dose of contrast material. The ability to further customize and individualize contrast injection during coronary CTA will be important in tailoring the protocol to the clinical question while taking into account the patient's physiology and anatomy. Further improvements in scan performance will require adaptation of scanning technique to patient-related factors, such as cardiac output and body weight, and may make use of more sophisticated bolus geometries. Exciting new applications of cardiac CT that will require customized injection protocols include assessment of biventricular function and myocardial perfusion. Continuing advances in CT scanner design, coupled with the improved use of contrast media, will no doubt improve the reliability and clinical applicability of this promising imaging technique. Optimizing Contrast Injection for Coronary CT Angiography and Functional Cardiac CT. Appl Radiol.